Some of the musical talent featured at past events includes the James Barker Band, winner of the Emerging Artist Showcase at the Boots and Hearts Festival in 2015, Vanessa Marie Carter, winner of the Emerging Artist Showcase at the Boots and Hearts Festival in 2016, River Town Saints, winner of the Single of the Year award from the Country Music Association of Ontario for their song Cherry Bomb, and Jessie T.
After the concert is finished, visitors can enjoy a huge grand finale – a fireworks show off of the roof of Kitchener City Hall. Please note, this show is dependent on weather and wind conditions. 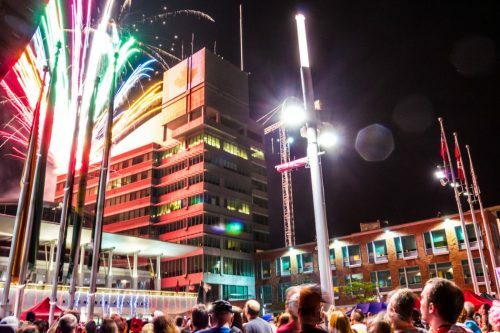 Canada Day in Downtown Kitchener also features a number of delicious options for food and drink. There are food vendors and a licensed area for those over 19 years of age. Another part of the Canada Day in Downtown Kitchener event occurs at the Kitchener Market. Visitors can enjoy live country music, face painting, crafts, and a patio setup on the piazza. Past performances have included a family show by Erick Traplin, a well-known children’s entertainer and songwriter. Funding for the event, is provided by Canadian Heritage. The event was also made possible in partnership with the Kitchener Market, the Waterloo Region Record Community Partnerships Program, and the Waterloo Region Record Kids to Camp Fund.